Barkham Parish Council is recognising the sacrifices of local men and the centenary of the outbreak of WWI by joining with Wokingham Town Council in their Wokingham Remembers activities including the borough-wide Heritage Memorial Trail which includes research on three residents from Barkham, who were killed in the service of their country. These are Frederick Lailey Eric Sturges and Reginald Arthur Smith. Additionally we have discovered other residents who served in WW1. On a gravestone in the churchyard of St James is the name of Frederick Ernest Hutt who fought in WW1 but died after the War had ended as a result of its effects on him.There are also details of his three brothers who also served. John Francis Coston is also buried in the churchyard; he served in both the Second Boer War and WW1 and died in 1922. Alfred Thomas Key is mentioned on his grandfather's gravestone at St James, he was a sailor in the Royal Navy who died in 1916 and is buried on the Greek island of Lemnos. Lastly William James Flower who enlisted and survived the war. He later became the landlord at The Bull, Barkham. Their biographies are below and we would like to hear from any of their families. More information on the soldiers of the Great War from the Wokingham area in general can be seen at the Wokingham Remembers website. Barkham Parish Council would like to thank Janet Firth who was responsible for all the Barkham research for this project. Frederick LAILEY was born in Rutt Hill Lane (now Hayes Lane) in Barkham in 1898, the eldest son of nine children born to Mary, nee CANNON and Frederick LAILEY, who worked on the Bearwood Estate. Frederick Jnr was pre-deceased by four infant sisters. Freddy attended Aborfield and Barkham National School; he was twice mentioned in the Headmaster’s Log Book for being absent (when well!). The family moved to Church Farm Cottages, Barkham. He enlisted at Reading in the Army Service Corps Forage Department at the age of seventeen. This was a vital role, to feed almost 870,000 horses and mules destined for the front. His enlistment Attestation states he would serve in the United Kingdom only and for the duration of the war. However he must have hankered for a more adventurous life, for by 1918, Frederick was serving in the 10th Battalion the Royal Warwickshire Regiment (Private 34867). On 21st March 1918 the 10th Battalion was in Vittoria camp near Barastre (France) and the following day was in action east of Beaumetz, occupied by the Germans. There was shellng, but no attack. Frederick suffered a gunshot wound to his left knee joint on one of these two days, which fractured his tibia; He was brought back to England, but untreatable septicaemia followed. Frederick LAILEY died with his mother by his side, in the Barry Road Military Hospital, Northampton on 6th June 1918; he was 19. His grave is marked by a military gravestone on the west of the main path to the church door of St James, Barkham. Frederick’s name is on the commemorative plaque on the north wall of St James, but not on the War Memorial at Arborfield Cross as the family wanted him remembered in Barkham, as he was very much a 'Barkham boy'. More recently his name was added to the memorial in the Royal British Legion HQ in Arborfield. His family still live and work in the area. Edward Eric STURGES (known as Eric)) was born in Chelsea on 6th May 1888, the eldest of three children of Edward Murray STURGES and his wife Eliza Rhoda STURGES, who came from Australia. Eric was at school at Bigshotte Prep School, Bigshotte Rayles, Wokingham Without, Winchester College (1902-3) and finally Lancing College (1903-6). After leaving school he became a Railway Engineer, in the 1911 Census his occupation was recorded as an Electrical Mechanic. The STURGES family moved to Barkham Square in 1904. On the outbreak of WWI Eric enlisted, in the 24th Signal Coy, Royal Engineers, in Portslade, Sussex, but finally in the summer of 1916 transferred to the 10th (Service) Battalion, the Kings Own Yorkshire Light Infantry at Pontefract (Private 37772). On 25th September 1916, his was one of the assaulting battalions on two German trenches outside the French town of Gueudecourt on the Somme. They were forced to take cover in a line of shell holes. Eric was killed in this attack and reported missing; he was aged 28. His name is on the Thiepval Memorial to the Missing of the Somme (Pier and Face 11C and 12A, with others of his Battalion). The Memorial was designed by Edward Lutyens to commemorate the 72,195 casualties of the Battle of the Somme. Eric STURGES’ name is included on the War Memorial at Arborfield Cross, on the commemorative plaque on the North wall of St James, Barkham (where unfortunately his surname is spelled with two ‘S’). There is a family memorial on the East wall of the South transept. His name is on the plaque in the Royal British Legion HQ Arborfield and on Winchester College and Lancing College War Memorials. Eric’s grandfather was the Rev. Canon Edward STURGES, Rector of All Saints, Wokingham, after whom Sturges Road is named. His younger brother was Lt General Sir Robert Grice STURGES (1891 – 1970), Royal Marines, KBE CB DSO who had joined the Royal Navy in 1908 and in WWI was involved in the Gallipoli Campaign and the Battle of Jutland. Reginald (known as Reggie) was the eldest of the four children born to Jesse SMITH and his first wife Ellen (née HANNINGTON). Reggie was born in October 1898 in Sandy Bottom (in the Sandy Lane area) just to the north of the Barkham Road and then in the Parish of St Paul’s Wokingham Without. In the 1901 Census there were two Jesse SMITHs as heads of households living there next to each other. The enumerator recorded them as Jesse SMITH 1 and Reggie’s father as Jesse SMITH 2. Reggie had a younger brother, Archibald John born in 1901, a sister, Edith Matilda born in 1904 and a second brother, Ernest Henry in 1908. By the time of the 1911 Census the family had moved to Barkham (Barkham Street), where Jesse had been living previously since the age of 21, as shown in the 1881 and 1891 Censuses. He was an agricultural labourer and very probably then worked for Edward Murray STURGES at Barkham Square. ‘In loving memory of Ellen aged 43 years, the beloved wife of Jesse SMITH. Also of Reggie aged 20 years who was killed about 25th March 1918 in the Great War’. This is recorded in the transcription of monumental inscriptions from the churchyard carried out by Mr L.H. CHAMBERS in May 1927 and now archived in the Berkshire Record Office1. Without this evidence we would not have known that Reggie SMITH served and lost his life in the First World War. At the time he made the record Mr Chambers wrote that the wording was picked out in black on a white painted iron memorial 1 ½ yards from a memorial to another young man who was drowned in the Great War, which is still extant. Sadly the memorial to Reggie and his mother can no longer be seen. On 19th March 1916 Reginald Arthur SMITH enlisted as a Private (20557) in the Royal Berkshire Regiment. He was wounded twice; first in April 1917. On September 7th 1917 The Berkshire Chronicle listed him as wounded again, on page 8 is the entry: ‘Pte R A SMITH 20557 (Barkham)’. Following this Reggie transferred to the 5th (Service) Battalion of the Oxfordshire and Buckinghamshire Light Infantry (Private 33614). This Battalion was back at the Somme in 1918 as part of the Fifth Army which retreated westwards from 21st March 1918 onwards during the German Army Spring Offensive and suffered heavy casualties. Reginald was killed on 23rd March 1918. His grave is in the British Cemetery at Grand Seraucourt, Aisne (Area 4, Row F, grave 4). and his name is recorded on the Pozières Memorial (Somme) to those 14,657 men whose graves are not known. Reginald is not named on the brass war memorial plaque in St James’ church Barkham, the war memorial at Arborfield Cross, nor the plaque in the British Legion in Arborfield. Frederick Ernest HUTT (known as Fred) was born in the summer of 1899, the youngest of the nine children of Timothy and Ellen HUTT (née BROADHURST) of Barkham who lived along Rutt Hill, now named Hayes Lane, but sometimes in the Census recorded as ‘Coombes Hill’. Fred had seven older brothers and one sister. Lucy was the eldest, born in 1878; his brothers were Albert Francis, 1880; Harry Job, 1882; William James, 1885; Walter, 1887; Arthur; 1890 Timothy, 1893 and Ralph, 1895. Timothy senior was recorded in both the 1891 and 1901 Censuses as a woodman like his Father, who lived two doors away. Presumably they were employed in managing the woodland in the Coombes which then belonged to the Bearwood estate, owned by the WALTER family. Until the outbreak of WWI the LAILEY family were neighbours. Before he enlisted in the Army Service Corps, young Frederick LAILEY was also a woodman (see above). About the time of the death of Arthur WALTER in 1910, Timothy HUTT senior had begun work as a brickmaker’s labourer in Thomas Lawrence’s New Yard, the brick works and tilery on East Heath and the family had moved to one of ten cottages for employees:1 Douglas Cottages, Eastheath, Wokingham Without. Fred enlisted into the 6th Battalion of The Royal Warwickshire Regiment as a Private (26785) on 2nd June 1917 at the age of 182. He was discharged on 20th February 1919 at the age of 19 [20 years in the Army record]. The Roll of Individuals entitled to the silver ‘War Badge’, which included men of the RWR who were wounded or were sick, records that he was suffering from ‘sickness’. Frederick was awarded Silver War Badge number B201487 in 1919 and the Victory and Service medals. By then his family had moved to Evendons Cottages along the south-east side of Evendons Lane, Wokingham Without, almost opposite Blagrove Lane. After nearly four and a half years more of illness Fred died at home on 10th September 1923 aged 24, as stated on his death certificate of pulmonary tuberculosis. This was no doubt the ‘sickness’ reported on his discharge. He might have picked up the primary infection years before and it had flared up whilst serving abroad. The 6th Battalion had been sent to support the Italian Army against the Austrians and Germans. From November 1917 they spent time either in the Venetian plain adjacent to swamps or the foothills of the Italian Alps in rough trenches carved out of granite, in crowded unclean conditions with poor nutrition, which might have exacerbated his condition. Frederick’s gravestone is of an open-book style made from white marble, south of and not far from the path leading to the south church door in St James’ churchyard, Barkham. ‘In loving memory of Frederick E Hutt, 6th Warwickshire Regiment, the beloved son of Ellen and Timothy Hutt, who died of wounds received in the Great War, September 10th 1923 aged 24 years’. All was done to soothe his pain. Three of Fred’s brothers had emigrated to Alberta in Canada before the War; three others also served in WWI. 1.Dumbleton, Michael 1990 Brickmaking: A Local Industry booklet, Bracknell and District Historical Society. Of Frederick Ernest HUTT'S seven brothers, two definitely and possibly three if correctly identified, also served in the forces during The Great War. There may be others; if so we would like to hear about them. Harry Job HUTT was the second of the eight sons of Timothy and Ellen HUTT, was born in 1882 in Rutt Hill Lane (now Hayes Lane) in Barkham. He served as a Gunner in The Royal Field Artillery (212496); he was discharged in January 1919. Walter HUTT the fourth of the eight sons of Timothy and Ellen HUTT was born in Rutt Hill (now Hayes Lane) Barkham in 1887. Walter was already in the Navy by the time of the 1911 Census, when he is recorded as a Stoker 1st Class, on board HMS Amethyst2 which was in the East Indies at the time. HMS Amethyst served in 1915 during the battle for the Dardanelles and at Gallipoli. Between 1916 and 1918 she protected the east coast of South America. We can only suppose that Walter served on her during this period. Ralph HUTT the seventh of the eight sons of Timothy and Ellen HUTT was born in Rutt Hill Lane (now Hayes Lane) Barkham in July 1895. His birth was registered in Wokingham as were his brothers and sister. It is very likely that he was the Ralph Hutt who joined the Navy at age 12. The Navy record says he was born on 10th July 1895 in Reading. He began as a Boy Second Class, at the age of 12, served in this capacity on various vessels until promoted to Able Seaman (AB) from 1914 to 1925. Three of Frederick’s brothers emigrated to Canada before the First World War lived in Calgary, Alberta and worked on the Canadian Pacific Railway. 1. HMS Amethyst was a 3rd Class protected cruiser of the Gem (Topaz) Class, launched in 1903. At the outbreak of WWI, this vessel was the leader of the Harwich Force Destroyer Command. John Francis COSTON 1875 – 1922. John Francis COSTON was born in ‘The Oaks’ Bowdon, Cheshire, in October 18751, the only surviving son of Francis Wigley and Mary Fanny COSTON, née HICKS. His Grandfather John COSTON , a wealthy merchant, died in December thatsame year and his Father died in April the following year 1876 at the age of only 27. John Francis COSTON became a professional soldier; he enlisted in the 3rd Battalion, the York and Lancaster Regiment when very young. It may be that he was at school in York and part of the Officer Cadets; the YLR was the local regiment. About the time of his seventeenth birthday he was appointed Second Lieutenant. This published in The London Gazette on 9th December 18922. John was part of the British force sent to South Africa in the Boer Wars 1899 -1902. According to the documentation accompanying the awards of medals, he fought in Cape Colony, the Transvaal (Tugela Heights) and the Relief of Ladysmith. He was awarded the Queen’s South Africa Medal and the specific clasps for 1901 and 19023. No doubt seconded from the 3rd he fought with the 1st Battalion of the York and Lancaster Regiment. It is uncertain why he moved to Berkshire but in 1897 before the Second Boer War John COSTON bought Evendons Farm (previously Evendons Manor) 4 off Evendons Lane, Wokingham Without, in the parish of St Paul’s Wokingham. In the April 1901 Census, he was recorded as head of the household at Evendons Farm aged 25, a Second Lieutentant of the York and Lancaster Regiment living with his widowed Mother, before returning to South Africa,. The 19th century farm house is now part of Sand Martins Golf Club House. In April 1904 John married Marjorie Hills NICHOLSON at All Saints’ church, Wokingham5. She was the eldest daughter of Alfred James and Letitia Nicholson of Glebelands, Wokingam. Alfred NICHOLSON was a Director and later Chairman of the Linoleum Manufacturing Company. Marjorie’s older brother Edward had also served in the Boer War6. John and Marjorie had three daughters: Diana Mary, born in October 1904 and baptised in All Saints, Wokingham7; Joan Marrianne in April 1907 and Elizabeth Marjorie in March 1911, both baptised in St James’church Barkham8. In the 1911 Census when at Evendons Farm, John Coston described himself as a Yeoman Farmer, clearly therefore involved with farming himself. John Francis COSTON was very public-spirited and from 1908 became the Rural Councillor for Barkham on the Wokingham Rural District Council, which met in the Board Room at the Union Workhouse (now Hospital), chaired by Edward Murray STURGES of Barkham Square. John signed the Declaration of Acceptance of the Office at the meeting on 7th April 19089 and duly took his seat. He served as a Rural District Councillor for the next fourteen years, with a break of five years due to war service; he returned having been re-elected as Councillor for Barkham in April 1919. He served on the Isolation Hospital and Finance Committees, but for the longest period on the Highways Committee; after April 1919 he was on the Drainage Committee, in connection with the ‘Crowthorne and Sandhurst Drainage Scheme’ which was to provide the service for the parishes of Finchampstead and Wokingham Without. When WWI began John was recalled immediately to the York and Lancaster Regiment and was promoted to Captain of the 2nd Battalion. His Medal Index Card showed that by 29th November 1914 he was in France. How long he was there is uncertain as the 2nd Battalion YALR is recorded as not leaving the country until September 191510. The Index card showed that he was discharged from the army on 18th January 1921. There had been tragedy for his wife’s family in Wokingham during the First World War; she lost three of her four brothers killed in action, Edward, Bruce and Victor Hills NICHOLSON11 She and her two sisters now had only one surviving brother, Walter; he was awarded the Military Cross in 1918, but was killed during the Second World War. Captain 1st York and Lancaster Regiment. The Wokingham Rural District Council met on the day of his funeral. The Minutes quote the Vice-Chairman who referred to ‘the recent death of Captain COSTON – a late member of the Council - and moved that the Clerk convey to Mrs COSTON and family the Council’s deep sympathy in their sad bereavement. The Resolution was carried by all members standing.’9 The Chairman was attending the Funeral. His widow and children let Evendons Farm and moved to a house in South Drive. By 26th September 1940 the day of the marriage of her youngest daughter Elizabeth in India to Major Alan E Belchamber (11th King George’s own Sikh Regiment), Marjorie COSTON had moved to Greenacres, Hogmoor Lane, Hurst, Berkshire. Www.british-history.ac.uk PAGE W and DITCHFIELD P H (eds) 1923 A History of the County of Berkshire: Volume 3. Originally published by Victoria County History, London, 1923, pp 225-236. Alfred Thomas KEY was born in Stamford Hill, Tottenham on 28th July 1892, the eldest son of Mary Ann, daughter of Robert and his wife Mary Ann YALDEN. Mrs KEY was a self-employed dressmaker and her husband Alfred Alexander KEY, who was born in Shropshire, was a bootmaker and sometime Prudential Insurance Agent. At the time of both the 1901 and the 1911 Censuses they were living at 20, Rose Street, Wokingham. Alfred had a younger sister, Helen Mary born in 1895 who also became a dressmaker and a younger brother, George Albert who was born in 1900. The house and its neighbours were demolished during the late 1960s and replaced by a trio of brick town houses, numbers 20, 22 and 24. The organ in St James’ church Barkham which Alfred played, was between the east end of the nave and the north transept and had to be hand-pumped by an assistant to run the bellows; only the two larger houses in Barkham had electricity at this time. 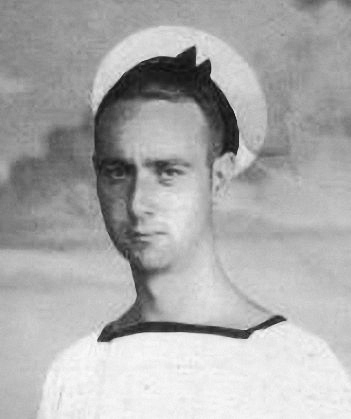 Alfred joined the Royal Navy and served on HMS Rowan as a Ship’s Steward Assistant, Service Number M 12463. In the spring of 1916 he was drowned at the age of 23 on 1st April 1916 in the Aegean Sea, with another, Canadian, rating. We do not know the exact circumstances, save that it was not due to enemy action. There is more information on the website Wokingham Remembers including personal details from Alfred’s great niece and photographs of him. HMS Rowan was based at the island of Lemnos and spent most of its time cruising between Lemnos, Bulgaria and Greece.1 She was an Armed Boarding Steamer (ABS) launched in 1909 and was used to examine vessels at sea – thus enforcing the naval blockade. The ABSs worked with cruisers who stood off and covered the vessel to be inspected. Alfred was buried in the Portianos Military Cemetery (at position 3. C. 340) in West Murdros, on the Greek island of Lemnos in the Aegean Sea. His name is on the War Memorial on the south wall of the Lady Chapel in All Saints’ church, Wokingham. 1. Discussion on www.1914-1918.invisionzone.com Great War Forum about HMS Rowan, including information from a descendant of a serving sailor at the time. William James FLOWER lived in a house on Coppid Hill, Barkham Road, Barkham before the outbreak of WWI. He married Annie Sarah PROLENT on 3rd August 1914, the day before War was declared and they moved to Milly Cottage, Sandford, Woodley. At the time William was working as a groom. The National Registration Act was passed by the Government in of July 1915 to find out how many men between the ages of of 15 and 65 were engaged in each trade. The ‘Group’ or ‘Derby Scheme’ was brought out on 16th October 1915, to stimulate the recruitment of men and increase numbers. At that time William enlisted in Reading in the Royal Berkshire Regiment (Private 41273). He was then aged 28 years and 7 months. His Attestation records that he was to serve ‘one day with the Colours and the remainder of the period in the Army Reserve, in accordance with the provisions of the Royal Warrant dated 20th October 1915’. His Attestation is stamped with the comment ‘called up from AR (Army Reserve) Class ‘B’’ and it seems from another stamp on the document that he was awarded a medal, probably the Victory medal. Many more residents of the parish may have been in a similar situation. In 1928 William became landlord of The Bull Inn at Barkham; his Father had been a publican in Kent. William was ably assisted by his wife Annie, who continued as landlady after William’s death on 4th November 1947, at Wingfield Morris Orthopaedic Hospital, Oxford, aged 59.